Condé Nast Traveler took this idea further by stepping out of the way and letting their fans to talk to each other. Other brands are choosing to use micro-influencers -- those with thousands of followers, rather than millions -- in lieu of more famous celebrities to access more niche communities and keep their marketing efforts more relatable. The reason is simple: direct messaging offers customers a greater sense of empowerment, not to mention relief from waiting in long queues or phone holds to resolve a customer service issue. Being able to seamlessly contact a large company to resolve an issue -- or get access to their booking info -- dramatically mitigates the slow bureaucratic stresses of dealing with larger brands. That is, until the tide changes again. 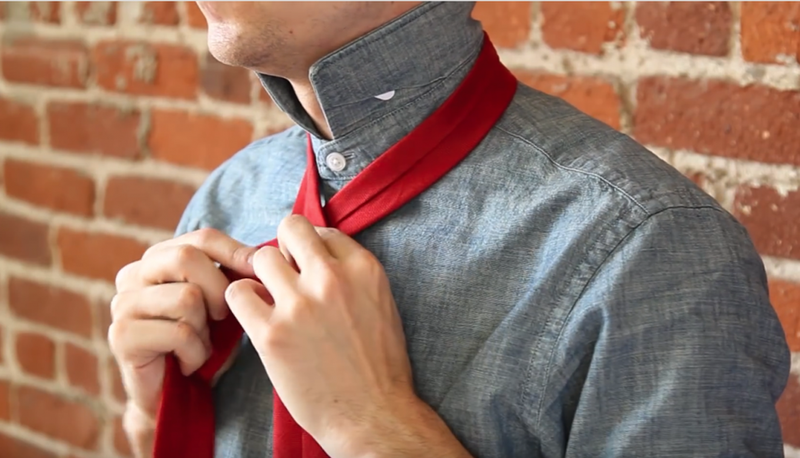 One of Ties.com's YouTube video guides with step-by-step instructions for tying necktie knots. If you’re anything like me, you’ve developed ninja-like reflexes to swat away pop-ups and ads with lightning speed. You’re never one second too late to press the “Skip Ad” button before a Youtube video starts and you DVR your favorite programming (or simply watch Netflix) to avoid all the annoying adverts. Why have we become so accustomed to treating adverts like pesky mosquitoes? Perhaps it’s because they’re actually pretty similar. After all, companies that spend money on ads prioritize getting in front of your face whether you like it or not. I know this is controversial and advertisers are picking up their pitchforks as we speak, but bear with me. My point is this: Traditional advertising is simply one way to get attention for your business, but it’s not the only way. Ties.com knows this, and the company is proof that you can drive growth and awareness without annoying customers with ads. According to CEO Omar Sayyed, the company has enjoyed 30% revenue growth each year over the last five years, and they’ve earned trust by providing value with digital content that educates and inspires, rather than popping up when you least expect it to. I first heard of Ties.com a couple years ago when I stumbled upon their comprehensive knotting guide. It gives step-by-step instructions for tying classic necktie knots, adventurous knots (check out the eldredge! ), and of course, the bow tie. The guides are top-notch. Look closely and you’ll get a feel for the writing, designing, and production skills required to execute the final product. The guides include text instructions, helpful sketches, and well-produced Youtube videos for more visual learners. Is all that effort worth the investment? Google’s Keyword Planner shows that those two questions get searched 800,000 times total each month. That’s nearly 10 million people who find Ties.com’s knotting guide every year, thanks to just two search terms! The end result? A web of educational, high-quality articles, visuals, and videos that rank for key terms and phrases and consistently drive people back to Ties.com to get their questions answered. Of course, Ties.com isn’t the only brand targeting these valuable keywords. The Tie Bar and The Art of Manliness both have their own tie knotting guides that rank well for the same keywords, but neither rank as high as the content from Ties.com. It’s an impressive feat, to be sure. So how did they do it? With such a strong roster of content success stories, you’d think the company had some master plan all along to produce smash hits and grow its web of online content into a sticky traffic funnel. But to hear CEO Omar Sayyed tell it, producing top-ranking content was almost an accident at first. Passion without direction is risky business. The Ties.com team began to pour hours and hours into the initiative, creating a library of articles and instructional content that they thought would attract interest. Some earned decent engagement, but some were gigantic flops. “I remember we were so excited about this one post that compared jean fits across different companies,” Sayyed recalls. Today their process is much more polished. The company has senior level writers on staff to ensure the content quality is consistent, they employ their own illustrators and video producers, and they filter their topics through keyword research to uncover the phrases and questions get the most search volume. “We’re much more deliberate about picking content topics today. We may not have started by targeting ‘how to tie a tie’ but we got there eventually,” said Sayyed. Armed with the right topics, the Ties.com creative team then determines the right medium and format to share each story. Depending on the topic, the content may lend itself better to a listicle with images, a beautiful infographic, or a quick YouTube tutorial. The extensive focus on content is impressive, especially for a small, private company like Ties.com. Still, there are priorities. Sayyed admits the company doesn’t do a great job of proactively getting people to share their content or link back to it -- two elements that are often helpful for improving Google rankings. Their method certainly seems to work. The tie-knotting guide did so well that Ties.com started the Man Academy, with all sorts of additional manly knowledge for the style-conscious gentleman. They have a complete guide to bow ties, the ultimate guide to the tie bar and even a guide on how to lace your dress shoes like a pro. While some companies focus exclusively on targeting people who are ready to make purchasing decisions, Ties.com has taken a different, longer-term approach. For example, consider the search term “how to tie a tie.” People who Google that phrase already have a necktie in front of them, and there isn’t any immediate commercial intent behind that query. But that audience clearly cares about neckties, which makes it a great demographic to develop a relationship with long term. The more that we, the consumers, associate tie advice with Ties.com, the more likely the company is to get our tie business long-term. The company has already published content that targets the most important, high-volume search queries. Sayyed says that they’re now focusing on niche phrases and questions that attract less search volume but educate people during other pivotal moments. They also write fun pieces that don’t target any specific keywords at all, but are merely created to drive blog traffic and position the company as a thought leader in the menswear space. 10 Things Women Find Most Attractive in Men's Style doesn’t do the company any good from a Google search perspective, but according to Sayyed, it has been huge for their visibility and has increased blog traffic by 8%. It’s comforting to see that a passionate men’s accessories company can climb its way to the top of search rankings by providing authentic, high-quality content. It means Google is doing its job by allowing the best content -- rather than just the best-optimized content -- to rank the highest. For those looking to follow in the footsteps of the men’s fashion brand, the Ties.com roadmap is a reminder that success in Google results is less a product of rocket science and secret sauces, and more a result of smart keyword research, a strict adherence to quality, and some good old-fashioned hard work. The Ties.com story is also a reminder that companies can grab attention through educational content rather than annoying advertisements. By earning trust and developing a relationship with its customers before they ever need to buy a tie, Ties.com solidifies its position as the men’s accessories go-to when you decide it finally is time to make a purchase. Wouldn’t it be great if you could get other bloggers, industry influencers, and relevant companies to share your articles for you? The key is providing a compelling reason to share your content. And I’d argue that the easiest way to do this is using flattery. Everybody loves compliments, right? If someone wrote an awesome article about you, wouldn’t you want to share it around? I know I would. This is a no-brainer. Email a ton of the best people in your industry and ask them the same question. For example, I might ask, “What are your favorite non-traditional social profiles for SEO and branding purposes?” My article could then be something like 11 Experts Share Their Favorite Non-Traditional Social Profiles. Make sure to explain the kind of article you’re pulling together in your email and make it clear the kind of names you’d be featuring. Don’t be bashful if you already have someone big onboard -- it’s more likely to convince others to submit their answers too. The genius of this strategy is that everyone you quote has some skin in the game. Every time one of those experts shares the article, you’re expanding your organic reach and earning industry credibility along the way. Just remember to follow up after you’ve published to alert them to the finished product. Loz James at WordTracker has a great example where he quotes 33 SEO experts on their link building tactics. NOTE: If you’re not getting any bites on your emails, you can literally just dig through the blog posts of experts in your field and find the quotes that tell your story. Everyone loves to be complemented. Find some people or companies worth shouting out and give them some space in your article. Explain what makes them stand out and link to their website (everyone loves backlinks). The benefits here are fairly obvious. Companies are likely to return the favor with a retweet or a share. When I shared 12 Twitter Tools to Take Control of Your Online Reputation, I emailed and/or tweeted people from every single company on that list. I got retweets from Canva, Buffer, RiteTag and a handful of others. Their enthusiasm completely catapulted my article without much of my own additional effort. This is a fun way to shout out someone famous and piggyback off their existing success. I might write something like 11 Ways Canva Has Completely Changed My Career. I can expect a bit more traffic thanks primarily to the name recognition, but more importantly, it might convince Canva to share my content. They’d love to have a glowing article like that shared around. The best part about this tactic is that the person or company you shout out doesn’t have to be directly involved in your industry. In fact, you might intrigue even more people if they aren’t related. Wouldn’t you be interested in 7 Tips From Geico’s Gecko on Improving Your Online Reputation? When seeking extra attention for your articles, it can be tempting to use crazy titles and even crazier content. But remember, it’s important to keep your blog in line with your brand. It would be pretty disappointing if your next article blew up but didn’t quote portray you the way you wanted. Get creative but don’t forget that you’re building your online reputation along the way. Sign up with your email address and I'll send you each day's challenge directly to your inbox. No fuss, no muss! Your email address is safe with me. I solemnly swear. Sure, an active blog can increase your website’s authority, but we don’t publish written content in a vacuum. We want other people to read our work, like it, share it, and link back to it again and again. These social signals and backlinks are a critical part of improving search results and the way we’re perceived online. So how do we drive more traffic back to our content? Perhaps the most obvious way to get people to see your content is to share it on social media. Post it on Twitter with a couple of popular hashtags. Share it with your connections on LinkedIn. Give it a chance to shine on Google+ and Facebook. I suggest that you share a combination of your own articles along with those of peers in your industry. That way, you don’t come across as wholly self-promotional and people come to respect you as a source of interesting aggregated information. My other suggestion is to set up an automated direct message on Twitter using Crowdfire. My direct message thanks new followers for following me and then points them in the direction of my most recent article or latest project It’s a good way to get traffic from people who have already shown an interest in your content. I give an in-depth look at repurposing content on Day 17 of this challenge. To reiterate briefly, the idea is to take all your hard work and repackage it for another audience on another platform. You can turn your article into a slideshow, use the content to answer questions on Quora, or republish on another publishing platform like LinkedIn Pulse or Medium. As you explore these options, try to remember to link back to your original article. You’ll direct more traffic back to your website and encourage people to read/learn more. Bloggers see a lot of comments, but the truly illuminating and remarkable ones are few and far between. If you can keep your comments consistently high quality, you’ll get the attention of the author and other viewers as well. This is an easy way to increase your visibility and start the networking process for guest posts in the future. Your comments on industry blogs can also impact your reputation in a negative way. Be careful not to link to your articles too much -- the last thing you want is to become known as spammy and self-promotional. Sharing your article in communities is different than just sharing it on social media. Have you ever explored those LinkedIn Groups? What about Google+ Communities? If not, you’re missing out on a big opportunity to get your content in front of an engaged audience in your industry. The nature and style of your conversations are going to depend on 1) the specifics of your online brand and 2) the social norms of the social network. For specific examples of starting conversations within social media communities, read Day 24 of this challenge. Paid promotions can be an incredibly useful supplement to a solid ORM campaign. You can earn engagement on Twitter, grow a wider audience of followers on Facebook, and send more traffic to your articles thanks to Stumbleupon or Outbrain. For an in-depth look at paid promotional campaigns, check out Day 25. Bonus: Explore Your Own Ideas! Have you thought about sending out a regular newsletter to your email contacts? What about sending direct messages to your connections on LinkedIn? When’s the last time you took a good look at your email signature? Chances are, it’s been a while. Most people send out dozens of emails every day. Your email signature can be a terrific way to unobtrusively get important information to people who matter in your professional and personal lives. Consider adding a line that encourages people to visit your blog or connect with you on social media. For reference, I’ve included what mine looks like here. I’ve recently added Bitly links on each hyperlink so I can keep track of how many clicks I’m earning. There could be a whole course on getting guest posts on third party publications. There’s a lot to learn about list-building, pitching, and maintaining editor relationships. At the risk of oversimplifying, today we’re just going to tackle the basics. The first step to getting published is to know the places you want to target. If you already have some ideas, jot them down now. Is there an industry blog you’re particularly fond of? Could you publish on your company blog? What about the blog of an organization you’re involved with? A publication you have a connection to? Get your ideas down and then it’s time for a little external research. Do a quick Google search for the best blogs in your industry that accept guest posts. I might try “the best reputation blogs that accept guest posts” but I could also try marketing, social media, or something similar. Of course, remember that getting on a decent site in your industry is better than none at all. Baby steps. The next step is to look up the requirements for pitching to particular publications. Some places ask for a specific subject line or certain formatting requirements. Ignoring these directions is the easiest way to get rejected. This is easier than it sounds. When I search “techcrunch post guest post requirements,” the first thing that comes up is A Guide To Guest Columns On TechCrunch, a whole page on this written by TechCrunch for bloggers like us. Muckrack is a tool we use at Brandyourself to get access to email addresses of editors, reporters, and writers. I find this tool invaluable, but if you don’t have this kind of access, there are a couple of things you can do. Look up the masthead. Do some investigation online to find contact info of the editors. Some publications will have names and email addresses right there on the Team page. Others will just have the names, but you can search them online and often find their contact info no problem. It’s not as if publications are exactly hiding from . Use submission forms. Some publications, like the Huffington Post, have submission forms where you can pitch your blog post without having an editor’s contact info. The last step is to draft the email you’ll be sending out. Use an engaging and simple subject line. I like GUEST POST: Name of the Title Here. Explain quickly what the article is about and why it’s important for the publication. Maybe it hasn’t been covered yet. Perhaps it’s super timely. Or it’s right in their wheelhouse. Keep the email short and sweet. Imagine if you had to sift through hundreds of these every week. Copy and paste the article (with copyright free, cited images) directly into the email. I attach the word doc too but this extra step is useful because I’ve had editors tell me they don’t open attachments. Once you have your list of editors, your publication requirements, and your pitch, then it’s time to send out your emails. Even with a terrific piece, this is primarily a numbers game. Remember that this is basically the email equivalent of cold-calling until you start developing some real relationships with these people. Try following up several days later and don’t be discouraged if you don’t get a nibble on your first try. It might take a few more articles and a longer list of editors before you begin forging those editorial connections. Today, I’m going to show you a quick and easy way to create original video content for Youtube. Youtube has the potential to rank well for your name -- you just need to nurture it and let it prosper. One of the easiest ways to make videos? Animate your slideshows. We’re going to use Keynote to make the magic happen. If you made your slideshow on Keynote already, then great. If you did it on something like Canva, just import the JPG files and drag them one by one into Keynote as slides. Once you’ve done that, it’s time to start adding animations. Click Animate in the top right corner. Then click on your first slide. You need to have the slide selected so you can make a “transition animation.” Otherwise you’ll be making an “action animation” for one of the elements in the slide. Under Transitions, click Add an Effect, and choose one to see what it does. I like Doorway, so I chose that one. Go through each slide and do the same thing. Feel free to keep the same transition for each slide to give a consistent effect, or go for different ones to switch it up. If you made your slideshow in Keynote, you can animate different elements within each slide as well, but there’s no need to go overboard with this. I like to keep these simple so they don’t come across as cheesy. Once you’ve finished adding transition effects, it’s time to add some audio. There are a number of websites that offer copyright free tunes. My favorite is Incompetech but you can do a quick Google search and find more. Once you’ve downloaded a royalty-free mp3 file you like, go back into Keynote and click Document at the top right corner. Then click Audio. Drag your audio file into the Soundtrack section. Then it's time to export. Hit File → Export to → Quicktime. Hit next (or change your playback settings if you wish) and save the file. Now all that’s left to do is go into Youtube, upload the video and give it a title and description. Give me a shout on Twitter if you’re having trouble and I’ll be happy to help.